Quebec is a province in eastern Canada. Known as la belle province ("the beautiful province"), Quebec is bordered to the west by the province of Ontario, James Bay, and Hudson Bay. To the north are the Hudson Strait and Ungava Bay, to the east the Gulf of Saint Lawrence, the provinces of New Brunswick and Newfoundland and Labrador, and to the south the United States (the states of New York, Vermont, New Hampshire, and Maine). It also shares maritime borders with the Territory of Nunavut and the provinces of Prince Edward Island and Nova Scotia. Quebec is Canada's largest province by area and its second-largest administrative division; only the territory of Nunavut is larger. It is the second most populated province, and most of its inhabitants live along or close to the banks of the Saint Lawrence River. The central and northern portion of the province is sparsely populated and inhabited by the aboriginal peoples of Canada. Quebec, then called Canada, formed part of the colonial empire of New France until the Seven Years' War, when it was conquered by Great Britain; the 1763 Treaty of Paris formally transferred the colony to British possession. Quebec became a province of the Canadian Confederation upon its founding in 1867. While the province's substantial natural resources have long been the mainstay of its economy, Quebec has renewed itself to function effectively in the knowledge economy: information and communication technologies, aerospace, biotechnology, and health industries. The official language of Quebec is French; it is the sole Canadian province whose population is mainly French Canadian, and where English is not an official language at the provincial level. 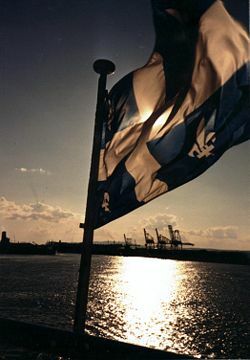 Nationalism plays a large role in the politics of Quebec, and all three major provincial political parties have sought greater autonomy for Quebec and recognition of its unique status. Sovereigntist governments have held referendums on independence in 1980 and 1995. In 2006, the Canadian House of Commons passed a symbolic motion recognizing the "Québécois as a nation within a united Canada." In 1870, Canada purchased Rupert's Land from the Hudson's Bay Company and over the next few decades the Parliament transferred portions of this territory to Quebec that would more than triple the size of the province. In 1898, the first Quebec Boundary Extension Act expanded the provincial boundaries northward to include the lands of the indigenous Cree. This was followed by the addition of the northernmost lands of the Inuit to create the modern Province of Quebec. As a result of the boundary expansions, the province currently occupies a vast territory (nearly three times the size of France), most of which is very sparsely populated. 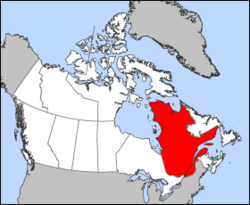 More than 90 percent of Quebec's area lies within the Canadian Shield and includes the greater part of the Labrador Peninsula. The most populated region is the Saint Lawrence River valley in the south, where the capital, Quebec City, and the largest city, Montreal, are situated. North of Montreal are the Laurentians, a mountain range, and to the east are the Appalachian Mountains, which extend into the Eastern Townships and Gaspésie regions. Quebec's highest mountain is Mont D'Iberville, which is located on the border with Newfoundland and Labrador in the northeastern part of the province. The Gaspé Peninsula juts into the Gulf of St. Lawrence to the east. The northern third of the province is a region known as Nunavik (not to be confused with the province of Nunavut), which is subarctic or arctic and is primarily inhabited by Inuit. A major hydroelectric project is found on the La Grande and Eastmain rivers in the James Bay region and on the Manicouagan River, north of the Gulf of St. Lawrence. Quebec has three main climate regions. Southern and western Quebec, including most of the major population centers, have a humid continental climate with warm, humid summers and long, cold winters. The main climatic influences are from western and northern Canada which moved eastward and from the southern and central United States that move northward. Due to the influence of both storm systems from the core of North America and the Atlantic Ocean, precipitation is abundant throughout the year, with most areas receiving more than 40 inches (1,000 mm) of precipitation, including over 120 inches (300 cm) of snow in many areas. Severe summer weather (such as tornadoes and severe thunderstorms) are far less common than in southern Ontario, although they occasionally occur. Most of central Quebec has a subarctic climate. Winters here are long and among the coldest in eastern Canada, while summers are warm but very short due to the higher latitude and the greater influence of Arctic air masses. Precipitation is also somewhat less than farther south, except at some of the higher elevations. The northern regions of Quebec have an arctic climate, with very cold winters and short, much cooler summers. The primary influences here are the Arctic Ocean currents (such as the Labrador Current) and continental air masses from the High Arctic. At the time of first European contact and later colonization, Algonquian, Iroquois, and Inuit groups were the peoples of what is now Québec. Their lifestyles and cultures reflected the land on which they lived. Seven Algonquian groups lived nomadic lives based on hunting, gathering, and fishing in the rugged terrain of the Canadian Shield: (James Bay Cree, Innu, Algonquins) and Appalachian Mountains (Mi'kmaq, Abenaki). St. Lawrence Iroquoians lived more settled lives, planting squash and maize in the fertile soils of the St. Lawrence Valley. The Inuit continue to fish and hunt whale and seal in the harsh Arctic climate along the coasts of Hudson and Ungava Bays. These peoples traded fur and food and sometimes warred with each other. The name "Quebec," which comes from a Míkmaq word meaning "strait, narrows," originally referred to the narrowing of the Saint Lawrence River off what is currently Quebec City. There have been variations in spelling of the name: Québecq, Kébec, and Québec. Basque whalers and fishermen traded furs throughout the 1500s. The first French explorer to reach Quebec was Jacques Cartier, who planted a cross either in Gaspé in 1534 or at Old Fort Bay on the Lower North Shore. He sailed into the Saint Lawrence River in 1535 and established an ill-fated colony near present-day Quebec City at the site of Stadacona, an Iroquoian village. Samuel de Champlain was part of a 1603 expedition from France that traveled into the St. Lawrence River. In 1608, he returned as head of an exploration party and founded Quebec City with the intention of making the area part of the French empire. Champlain's outpost was his base to forge a trading, and ultimately a military, alliance with the Algonquin and Huron nations. Natives traded their furs for French goods such as metal objects, guns, alcohol, and clothing. 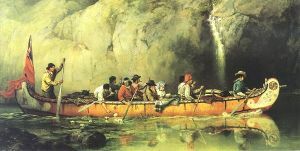 From Quebec, voyageurs (licensed fur traders) and Roman Catholic missionaries used canoes to explore the interior of the North American continent, establishing fur trading forts on the Great Lakes, Hudson Bay, Ohio River, and Mississippi River, as well as the Prairie and Missouri Rivers. After 1627, King Louis XIII of France introduced the seigneurial system—a semi-feudal system of land distribution used in the colonies of New France—and forbade settlement by anyone other than Roman Catholics. Under the seigneurial system, the lands were arranged in long, narrow strips, called seigneuries, along the banks of the Saint Lawrence River. Each piece of land belonged to the king of France and was maintained by the landlord, or seigneur. Sulpician and Jesuit clerics founded missions in Trois-Rivières and Montréal or Ville-Marie to convert New France's Huron and Algonquin allies to Catholicism. New France became a royal province in 1663 under King Louis XIV of France with a Sovereign Council that included intendant Jean Talon. This ushered in a golden era of settlement and colonization in New France. The population grew from about 3,000 to 60,000 between 1666 and 1760. The colony's total population was limited, however, by a winter climate significantly harsher than that found in France; by the spread of diseases; and by the refusal of the French crown to allow Huguenots, or French Protestants, to settle. The population of New France lagged far behind that of the 13 British colonies to the south, leaving it vulnerable to attack. In 1753 France began building a series of forts in the British-held Ohio region. They refused to leave after being notified by the British governor and, in 1754, George Washington launched an attack on Fort Duquesne (now Pittsburgh) in an attempt to enforce the British claim to the territory. This frontier battle set the stage for the French and Indian War in North America. By 1756, France and Britain were battling the Seven Years' War worldwide. In 1758, the British mounted an attack on New France by sea and took the French fort at Louisbourg, Nova Scotia. 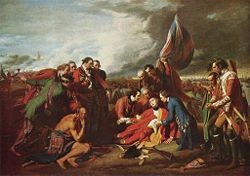 The Death of General Wolfe during the Battle of the Plains of Abraham, by Benjamin West. The French commander, Marquis de Montcalm, died the following day from wounds received in this battle. In 1759, General James Wolfe defeated General Louis-Joseph de Montcalm in the Battle of the Plains of Abraham outside Quebec City. The battle involved fewer than 10,000 troops between both sides, but proved to be a deciding moment in the conflict between France and Britain over the fate of New France, influencing the later creation of Canada. France ceded its North American possessions to Great Britain in 1763. In 1774, fearful that the French-speaking population of Quebec (as the colony was now called) would side with the rebels of the thirteen colonies to the south, the British Parliament passed the Quebec Act giving recognition to French law, the Catholic religion, and French language in the colony; before that Catholics had been excluded from public office and recruitment of priests and brothers forbidden, effectively shutting down Quebec's schools and colleges. By the Quebec Act, the Quebec people obtained their first charter of rights. That paved the way to later official recognition of the French language and culture. The act also sanctioned freedom of religious choice. At the outbreak of the American Revolutionary War, a 1775 invasion by the Continental Army met with early success but was later repelled at Quebec City. The American Revolution was ultimately successful in winning the independence of the 13 colonies. With the Treaty of Paris (1783), Quebec ceded its territory south of the Great Lakes to the new United States of America. Like their counterparts in Upper Canada, in 1837, English- and French-speaking residents of Lower Canada formed an armed resistance group to seek an end to British colonial rule. They issued a declaration of rights with equality for all citizens without discrimination, and a declaration of independence in 1838. Their actions resulted in rebellions in both Lower and Upper Canada. An unprepared British army had to raise a local militia, and the rebel forces were soon defeated. After the rebellions, Lord Durham was asked to undertake a study and prepare a report on the matter and to offer a solution for the British Parliament to assess. The final report recommended that the population of Lower Canada be assimilated, and the British government merged the two colonial provinces in 1841. The political union proved contentious, however. Reformers in both Canada West (formerly Upper Canada) and Canada East (formerly Lower Canada) worked to repeal limitations on the use of the French language in the legislature. The two colonies remained distinct in administration, elections, and law. In 1848, reformers returned the French language to legal status. In the 1860s, delegates from the colonies of British North America (Canada, New Brunswick, Nova Scotia, Prince Edward Island, and Newfoundland) met in a series of conferences to discuss self-governing status for a new confederation. The first took place in Charlottetown, Prince Edward Island, followed by one in Quebec City that led to a delegation going to London, England, with a proposal for national union. As a result of those deliberations, in 1867 the Parliament of the United Kingdom passed the British North America Act, providing for the confederation of most of these provinces. The former Province of Canada was divided into its two previous parts as the provinces of Ontario (Upper Canada) and Quebec (Lower Canada). New Brunswick and Nova Scotia joined Ontario and Quebec in the new Dominion of Canada. Prince Edward Island joined in 1873, and the Dominion of Newfoundland entered the confederation in 1949. The conservative government of Maurice Duplessis and his Union Nationale dominated Quebec politics from 1944 to 1960 with the support of the Roman Catholic church. Pierre Trudeau and other liberals formed an intellectual opposition to Duplessis's regime, setting the groundwork for the Quiet Revolution, a period of dramatic social and political change that saw the decline of Anglo supremacy in the Quebec economy, the decline of the Roman Catholic Church's influence, the nationalization of hydroelectric companies, and the emergence of a movement aimed at attaining independent statehood (sovereignty) for Quebec. Two referendums (in 1980 and 1995) rejected sovereignty. Beginning in 1963, a terrorist group that became known as the Front de libération du Québec (FLQ) launched a decade of bombings, robberies, and attacks directed primarily at English institutions, resulting in at least five deaths. Prime Minister Pierre Trudeau invoked the War Measures Act. Of the 497 persons arrested throughout Canada, 62 were charged; 32 were crimes of such seriousness that a Quebec Superior Court judge refused them bail. The fallout of the crisis marked the twilight of the FLQ, which lost membership and public support. Lévesque and his party had run in the 1970 and 1973 Quebec elections under a platform of separating Quebec from the rest of Canada. The party failed to win control of Quebec's National Assembly both times. In the 1976 election, he softened his message by promising a referendum (plebiscite) on sovereignty-association rather than outright separation, by which Quebec would have independence in most government functions but share some other ones, such as a common currency, with Canada. On November 15, 1976, Lévesque and the Parti Québécois won control of the provincial government for the first time. The question of sovereignty-association was placed before the voters in the 1980 Quebec referendum. The existing constitutional document, the British North America Act, could only be amended by the Parliament of the United Kingdom upon a request by the Canadian parliament. Sixty percent of the Quebec electorate voted against the proposition. After his loss, Lévesque began negotiating a new constitution and insisted that Quebec be able to veto any future constitutional amendments. The negotiations quickly reached a standstill. On the night of November 4, 1981 (widely known in Quebec as La nuit des longs couteaux or the "Night of the Long Knives"'), Federal Justice Minister Jean Chretien met all the provincial premiers except Lévesque to sign the document that would eventually become the new Canadian constitution. The next morning, they confronted Lévesque with the fait accompli. Lévesque refused to sign the document. In 1982, the new constitution was approved by the British Parliament, with Quebec's signature missing (a situation that persists to this day). In subsequent years, two unsuccessful attempts were made to gain Quebec's approval of the constitution. On October 30, 1995, with the Parti Québécois back in power, a second referendum on sovereignty took place. This time, it was rejected by a slim majority (50.6 percent to 49.4 percent); a clear majority of French-speaking Quebecers had voted in favor of sovereignty. The referendum was enshrouded in controversy. Federalists complained that an unusually high number of ballots had been rejected in pro-federalist areas. The Government of Canada was accused of not respecting provincial laws with regard to spending during referendums and of having accelerated the naturalization of immigrant people living in the province of Quebec (43,850 immigrants were naturalized in 1995, whereas the average number between 1988 and 1998 was 21,733). The PQ has promised to hold another referendum should it return to government. Given the province's heritage and the preponderance of French, there is an ongoing debate in Canada regarding the status of Quebec. Prior attempts to amend the Canadian constitution to acknowledge Quebec as a 'distinct society'–referring to the province's uniqueness within Canada regarding law, language, and culture–have been unsuccessful; however, the federal government under Prime Minister Jean Chrétien endorsed recognition of Quebec as a distinct society. On October 30, 2003, the National Assembly voted unanimously to affirm "that the Québécois form a nation". On November 30, 2006, the House of Commons passed a motion declaring that "this House recognize[s] that the Québécois form a nation within a united Canada." As only a motion of the House, it is not legally binding. The lieutenant governor represents Queen Elizabeth II as head of state. The head of government is the premier (premier ministre in French) who leads the largest party in the unicameral National Assembly or Assemblée Nationale, from which the Council of Ministers is appointed. The St. Lawrence River Valley is a fertile agricultural region, producing dairy products, fruits, vegetables, foie gras, maple syrup (Quebec is the world's largest producer), and livestock. North of the St. Lawrence River Valley, the territory of Quebec is extremely rich in resources in its coniferous forests, lakes, and rivers: pulp and paper, lumber, and hydroelectricity are still some of the province's most important industries. High-tech industries are very important around Montreal. It includes the aerospace companies like aircraft manufacturer Bombardier, the jet engine company Pratt & Whitney, the flight simulator builder CAE, and defense contractor Lockheed Martin, Canada. Those companies and other major subcontractors make Quebec the fourth biggest player worldwide in the aviation industry. Tourism is another important industry in Quebec, drawing an estimated 27.5 million people annually who spend approximately C$6.7 billion. Quebec is unique among the provinces in its overwhelmingly Roman Catholic population. This is a legacy of colonial times; only Catholics were permitted to settle in the New France colony. All major religions are represented, to some degree, especially in Montreal and Quebec City, where the Anglican Church of Canada has cathedrals. The allophone population of Montreal (those whose first language is neither English nor French) in particular represents many different religions and faiths. Montreal was once the center of Jewish culture in Canada, and retains a sizable Jewish population, especially visible in Côte Saint-Luc and in Mile-End/Le Plateau, which has a large Hasidic population. There are some 4,000 places of worship in Quebec City alone; hence, it is known as the city of churches. Among the ten provinces of Canada, Quebec is the only one whose majority (84.5 percent speak French as a dominant language) is francophone. Quebec's francophones account for at least 90 percent of all of Canada's French-speaking population. About 95 percent of the population has fluency in French. English-speaking Quebecers reside mostly in the Greater Montreal Area, where they have built a well-established network of educational, social, economic, and cultural institutions. The absolute number and the share of native English speakers dropped significantly during the latter half of the twentieth century (from 13.8 percent in 1951 to just 8 percent in 2001) due to a net emigration to other Canadian provinces. This decline is expected to continue in the early twenty-first century. The Fleurdelisé leads a ship to harbor near Quebec City. The Quebec education system is governed by the Ministère de l'Éducation, du Loisir et du Sport (Ministry of Education, Recreation and Sports). It is administered at the local level by publicly elected French and English school boards. Education begins at the age of 5 with kindergarten and grades 1-6 as elementary school. Secondary school is five years. All students must attend French-language public schools except in certain specific situations, such as children who have done most of their elementary or secondary studies in English elsewhere in Canada. These may attend publicly funded English schools. English is taught as a second language in French schools from Grade 1 onward. English schools offer French as a second language, French immersion, and fully bilingual programs. Formerly, school boards were divided between Roman Catholic and Protestant (called "confessional schools"). The latter system was established through the British North America Act, 1867 (today the Constitution Act, 1867), which granted power over education to the provinces. Article 93 of the act made it unconstitutional for Quebec to change this system. Consequently, a constitutional amendment was required to operate the separation of the State and the Church in Quebec. For more than a century before 1964 non-Catholic immigrants from outside Canada who settled in Quebec were not allowed to attend French Catholic schools. The Quebec Education Act of 1988 provided a change to linguistic school boards, a change that has not yet complete been fully implemented. In 1997, a unanimous vote by the National Assembly of Quebec allowed for Quebec to request that the government of Canada exempt the province from Article 93 of the Constitution Act. This request was passed by the federal parliament. Catholics maintain their rights to confessional schools in other Canadian provinces. The main public schools network offers the choice between moral or religious education while Catholics run their own separate schools. When public schools were deconfessionalized in 2000, Catholic and Protestant religious education (along with nonreligious moral education) classes continued to be part of the curriculum. To prevent court challenges by other religious groups wanting specialist religious education in schools, the government invoked the notwithstanding clause, which expired after five years. Quebec has the highest proportion of children going to private schools in North America. The phenomenon is not restricted to the wealthy. Many middle class, lower middle class and even working class families scrimp and save to send their children to private schools. The government of Quebec gives a pro rata subsidy for each child to any private school that meets its standards and follows its prescriptions, reducing tuition costs to approximately 30 percent of non-subsidized private schools. Most of the private schools are secondary institutions, though there are a few primary schools, most of them serving precise religious or cultural groups. Of the high school population of Quebec, 17 percent currently attends a private high school. The figure is even higher in urban centers such as Montreal, where 30 percent of high school students are in the private sector. Most students continue to CEGEP (Collège d'enseignement général et professionel (general and professional education college), where they can specialize in a number of different vocational or pre-university fields. The term of study is two years for pre-university and three years for most vocational diplomas. Like primary and secondary schools, both state-run and private CEGEPs exist. Unlike the state-run CEGEPs, private post-secondary schools usually do not combine pre-university and vocational programs in one institution. About half offer pre-university and the other half vocational programs. Primary school, secondary school, and CEGEP total 13 years of pre-university study, one more than other provinces. For this reason, most undergraduate university degrees in Quebec universities are only three years in length for Quebec students who have obtained a CEGEP diploma. Students from outside Quebec have this term supplemented by a freshman year at the beginning of their university career. The government of Quebec founded a network of universities in several Quebec cities, called the Université du Québec. All universities in the province have since become public in a similar fashion to other Canadian provinces. Quebec subsidizes post-secondary education and controls tuition fees, resulting in low student costs. Montreal has a higher percentage of university students in its population than all other major North American cities. Château Frontenac, the world's most photographed hotel, is iconic to the province of Quebec. Quebec is the largest French-speaking society in the Americas. Montreal is the cosmopolitan cultural heart of Quebec. Quebec is home to a people that are connected to the strong cultural currents of the United States, France, and the United Kingdom. Quebec is also home to 11 aboriginal nations. The architecture is characterized by the juxtaposition of the old and the new and a wide variety of architectural styles, the legacy of two successive colonizations (by the French and the British) and the close presence of the architecture of the United States. Noted for its religious heritage, Quebec has 122 religious buildings listed as historical monuments. The best known Roman Catholic churches include Saint Joseph's Oratory, Mary, Queen of the World Cathedral, Notre-Dame Basilica, and Notre-Dame de Québec Cathedral. Québec has some 400 museums. The Musée national des beaux-arts du Québec houses a large collection of seventeenth-century Québec art. The Montréal Museum of Fine Arts, one of the oldest in Canada, and the Musée d’art contemporain de Montréal, which exhibits the work of modern masters, both feature major international touring shows as well. The traditional folk music of Quebec has two main influences: the traditional songs of France, and the influence of Celtic music, with reels and songs that show a definite affinity with the traditional music of Canada's Maritime Provinces, Ireland, Scotland, and Brittany. Quebec has also produced world-class classical music over the years, such as the Montreal Symphony Orchestra, founded in 1934. Jazz also has a long tradition in Quebec. Montreal's annual International Jazz Festival draws millions of visitors each summer. While francophones currently constitute a little under 80 percent of the overall population, they also feature the lowest birthrate in North America. If such trends continue, researchers predict that the low birthrate among francophones and the lack of adoption of the French language and assimilation into the francophone culture by allophone (those whose primary language is neither English nor French) immigrants will cause the French-speaking population in Montreal to dive below the 50 percent mark in the coming decades. The decline in the francophone birth rate and the weakening position of the French language in Montreal directly led to the passing of the Charter of the French Language (Bill 101) by the Government of Quebec to protect the status of the French language as well as to increase the numbers of francophones in the future. Due to this legislation, children of allophone immigrants learn the French language and francophone culture through the public school system. Thus, they usually become fluent in French as well as in English. ↑ Charter of the French language Government of Quebec. Retrieved March 15, 2019. ↑ Census Profile, 2016 Census. Statistics Canada. Retrieved March 15, 2019. ↑ Gross domestic product, expenditure-based, by province and territory (2015) Statistics Canada. Retrieved March 15, 2019. ↑ Addressing Guidelines Canada Post. Retrieved March 15, 2019. ↑ 5.0 5.1 5.2 Quebec (QC) - Facts, Flags and Symbols Government of Canada. Retrieved March 15, 2019. ↑ Seigneurial System The Canadian Encyclopedia. Retrieved March 15, 2019. ↑ Résolution de l'Assebmblée Nationale du Québec October 30, 2003. Retrieved March 15, 2019. ↑ Parliament of Canada. Résolution de l'Assemblée Nationale du Québec November 30, 2006. Retrieved March 15, 2019. ↑ Recognition of the Québec Nation Secrétariat du Québec aux relations canadiennes. Retrieved March 15, 2019. All links retrieved March 15, 2019. This page was last modified on 15 March 2019, at 18:51.